I grew up in Marin County with a fascination for drawing and building Lego cities. Focused on becoming an urban planner, I graduated UC Santa Barbara (Environmental Studies/Political Science) but the pull toward art, and my parent's steady faith in me, eventually lead me to the Art Center College of Design in Pasadena. After graduating, I landed at the Nokia Design Center in Los Angeles to work as a Senior Graphic Designer for the Asia Pacific region. I later moved on to other creative pursuits at various design firms in the Bay Area. My corporate experience at the time spanned from art direction, graphic design, and copywriting, to branding, identity, exhibit and multi media design. Several of my projects found recognition in various publications worldwide, like I.D. Magazine and one earned a spot in the New York Film Festival. 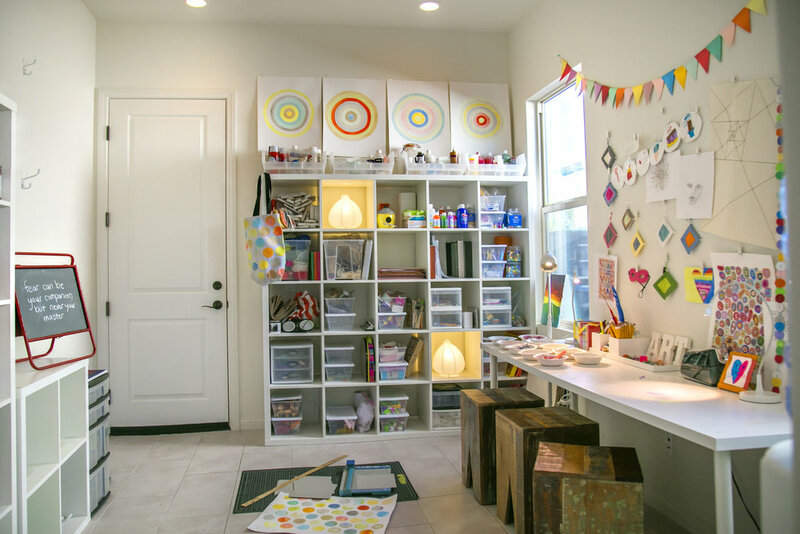 After relocating to San Diego in 2012 along with that wonderful husband Chad, and three young children, Luke, Reid and Brooklyn, I expanded my studio to include illustration, painting, fine art photography, 3D sculpture, collage, mixed media, and various types of decor. My bright and colorful home-based makery in Del Sur is where I craft the fresh and original creations I sell all over the world via my GLEAUX online shop ( here ) and other popular online retailers. I also work as a "candid" photographer, building a steady and genuine connection with my subjects and using my graphic designer's eye to frame and capture the essence of mostly unposed moments~ hopefully turning them, not only into precious memories, but into art. In 2017, my goal as both artist & photographer is to embark on a personal journey to study, practice, and celebrate the ART OF SEEING. Whenever possible, I get in a car or plane and go until I'm out of the "bubble" where I can sit quietly or wander, mostly unnoticed, with my camera or sketchbook. Here I can really witness and absorb the vibrations of the coarser, sometimes forgotten, more organic, unpolished, and un-zoned corners of life. I return home with a full range of emotion, appreciation and courage to create from deep within... to let expectation, judgement, market research, and pressure to follow popular trends, just fall away... to create unconsciously. part makery, part playground, part craft warehouse, part tinker space. . .
my home studio/office . . . Copyright 2018 GLEAUX art • photo • design. All rights reserved. All the images used in this site are the property of GLEAUX art photo design.